As the release of the ‘Tutto Verdi’ series from the Teatro Regio progresses, one has begun to have fears that the later Verdi operas will fail to measure up to the standards that have been set on DVD by productions from international houses across the globe. The issues of the early and middle period Verdi works have been welcome, because these pieces are so rarely encountered in the opera house; but with Macbeth and Luisa Miller we are coming to operas that have been performed by major artists in major productions with superb orchestras and conductors. One might be concerned that these Parma versions will simply fade in the face of the competition. As this DVD opens it seems that one’s concerns might well be justified. The orchestral playing in the Sinfonia is scrappy and sounds undermanned in the string department. When the opening chorus begins, the co-ordination between singers on stage and instruments in the pit leaves much to be desired. Then Fiorenza Cedolins in her opening aria sounds over-stretched by the coloratura. Happily things soon improve. Indeed from that point onwards the singing just gets better and better. Even the orchestra and chorus seem to settle down until by the time we reach the magnificent Third Act - the first of Verdi’s massive dramatic and musical structures, heralding the masterpieces that were just around the corner - everybody is firing on all cylinders to enthralling effect. True, the balance between voices on stage and the orchestra in the pit is still weighted towards the latter; better that than heavily amplified voices with the orchestra consigned to the middle distance. Certainly the playing is rivetingly dramatic. One does not feel that Donato Renzetti is one of the great Verdi conductors in the Toscanini tradition, but after the faltering opening scenes he certainly gets involved with the drama and accompanies the singers well. The singers are not constrained to produce volume at all costs. All the principals show a willingness to sing quietly, and the delicate shading we hear is as impressive as the stentorian delivery of the more heroic passages. The undoubted star of the show is Marcelo Álvarez. He ranges through the whole gamut of expression from quiet Donizettian lyricism to an Otello-like intensity in the final scene where he accuses Luisa of betrayal and then realises, too late, that he has failed to understand the conspiracy that has surrounded him. He delivers his big aria Quando le sere al placido (a favourite item at Three Tenors concerts) with a beautiful mezza voce far removed from any suspicion of histrionics. After her uncertain start, Fiorenza Cedolins is fully his match and she manages not only to act like Callas but also - more difficult still - to avoid sounding like her. She floats some superlatively spun high pianissimos, and at the moment in the final duet when Rodolfo asks her if she really loves Wurm, his hesitation and her horror - highlighted by extreme close-up camera work - has a positively cinematic intensity. Much of the success or failure of Luisa Miller lies with the three lower male voices. Leo Nucci was of pensionable age at the time of this recording, but you would never guess it from his firmly delivered tones. Unlike his younger self in earlier recordings, he is now willing to fine these down to a delicate mezza voce in places, to the inestimable advantage of the music and drama. Giorgio Surian as the implacable father is granite-toned and black as pitch. Only Rafal Siwek lets the side down; not in his singing, which is as black as his master’s and superbly controlled; but his acting in this production savours far too much of the pantomime villain, complete with eye shadow and evil grins. This character is not an Iago, glorifying in his nihilistic Credo; he is a mean-spirited and mendacious man, out for his own personal advantage and no more. Francesca Franci does what she can with the thankless role of the count’s niece, and the smaller parts are well taken. Another problem with this DVD lies with the production by Denis Krief, who was also responsible for sets and costumes. Schiller as a dramatist always brought out the best in Verdi, even when the adaptations let him down; but Schiller’s play Kabale und Liebe with its focus on class divisions in Germany fell foul of the Neapolitan censors, and Verdi was forced to transfer the action to the Tyrol and retitle some of the characters. Under the circumstances it might be regarded as quite permissible to relocate action and period, in the same way as Jonathan Miller took Rigoletto to New York via Verdi’s Mantua from its origins in the Paris of Le roi s’amuse. Here one is not quite clear what period and location we are intended to infer. The Millers live in a large Tyrolean log cabin, but the Count and his family seem to inhabit a very modern avant-garde 1930s mansion - or do they? - the chaise longue looks very turn-of-the-century - with abstract patterns on the walls. The costumes appear to date from around 1890, but the swords which the men produce are not. The situation is not helped by the fact that bits of various sets slide in and out without any very apparent motive, and at one point we are left with the Count in evening dress singing his aria Il mio sangue in front of a drop curtain, just as if he were giving a concert performance. The result is rather a muddle. Then again, when we come to the final Act, suddenly all comes right. Álvarez, Cedolins and Nucci are all on their top form, and the whole performance and its staging catch fire with a vengeance. The modern dress brings the drama to life in a way that mock-mediaeval German or Tyrolean costumes never could begin to approach. The audience, who earlier have shown a willingness to applaud at every full stop or semi-colon - they even interrupt halfway through the First Act’s concluding concertato - seem to hold their collective breath; and rightly so. One might perhaps comment however that the cameras don’t always point quite where one might wish - it is hard to see precisely what happens to Wurm at the end, for example. This DVD is rather an affair of threads and patches, therefore, which do not add up to a completely satisfying whole. Some of those threads and patches are excellent things indeed. 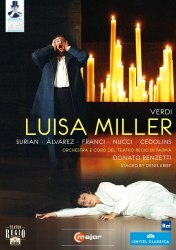 There are four rival DVDs of the opera in the current catalogue: one an Italian television production conducted by Gianandrea Gavazzeni, and one each from the Metropolitan Opera (conducted by James Levine), La Fenice (conducted by Maurizio Benini) and Opera National de Lyon (conducted by Maurizio Arena). The only one of these I have seen, a good many years ago, was the Metropolitan Opera production which despite a great cast - Pläcido Domingo, Renata Scotto and Sherrill Milnes - came in a real museum-piece of a staging which comprehensively sucked much of the singers’ dramatic involvement out of the work; I watched the final scene again to confirm my recollections. That at least cannot be said of this Parma performance, and the balance between singers and orchestra is better here too.